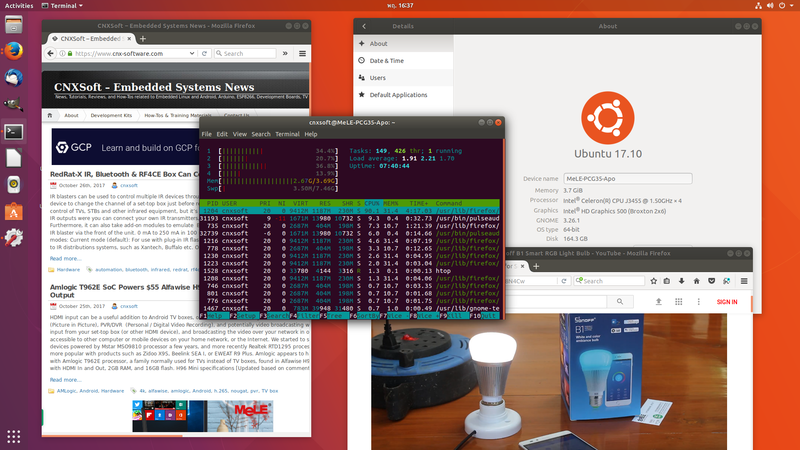 I completed the review of MeLE PCG35 Apo with Windows 10 Home a few days ago, and as promised, I’ve now installed the freshly released Ubuntu 17.10 in the Intel Celeron J3455 “Apollo Lake” mini PC. I’ll start by shortly explaining the step to install Ubuntu 17.10 in the M.2 slot, although you could also install it to the internal eMMC flash replacing Windows 10, then show what works and what does, and finally include a video reproducing the tests I usually do in Windows 10. We can now plug the USB flash drive with Ubuntu 17.10 into one of the USB port of the mini PC, start it up and press ‘Esc’ key to enter Apio Setup Utility (aka “The BIOS”). 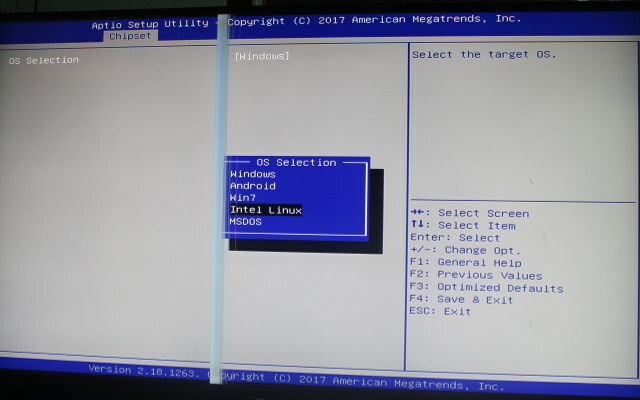 By default, the system will use the “Windows boot method”, but we can change that by going to Chipset->South Bridge, then OS Selection and select Intel Linux. Now go to the Boot menu and select our USB flash drive (I had to select “Partition 1”) to start Ubuntu installation. I did not want to remove Windows 10 (installed in the eMMC flash), nor wipe out the Program Files directory in the M.2 SSD, but still install Ubuntu 17.10 in the faster M.2 SSD, so I used a custom installation type. The eMMC flash, the M.2 SSD (/dev/sdc), SATA hard drive, and USB hard drive were all recognized by the system. I only modified the SSD partition by resizing the Windows’ “Program Files” partition to 64000 MB, and creating new partitions for the root file system (167913 MB) and swap (~8GB). 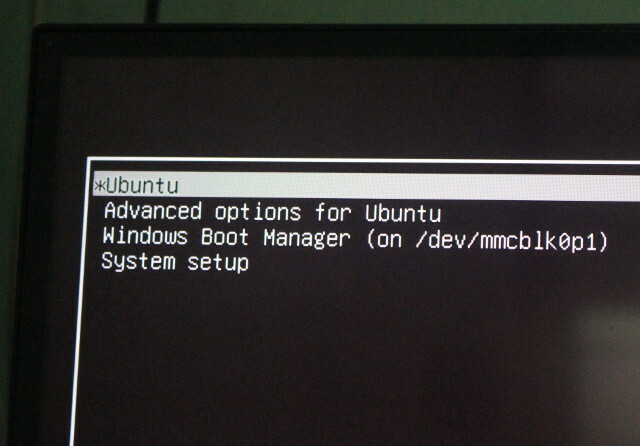 Once the changes were all applied I clicked on Install Now to complete the installation, and a few minutes later reboot with Grub giving the option between Ubuntu (default) or Windows Boot Manager. So we have a dual boot Windows 10 / Ubuntu 17.10 systems here, I selected Ubuntu and within a few seconds I could login to Ubuntu 17.10 and access the GNOME desktop environment. Canonical did a good job of making their GNOME implementation feels like Unity, but there are some obvious changes like the login prompt, different dash search location, and redesigned Settings menu. Good news if you don’t plan to use an SSD, but want to install Ubuntu or other Linux distribution in the computer. I also tested all ports and networking options of the device, and everything worked just fine. The video is fairly long, and I did not edit it to show how some parts are rather slow to load, especially Jet Racing Extreme, and to a lesser extent Candy Crush Saga. The Multi-tasking part is really fast, everything starts about as fast as on my much more powerful main computer (AMD FX8350 with 128 GB SSD + 16 GB RAM), ans for simple desktop tasks, even with multiple program, the system is really fast enough. Multitab browsing goes well too, but Candy Crush Saga takes quite a while to start, so much that I decided to play YouTube videos will the game started. 1080p YouTube video playback works OK, but once we switch to 4K, it’s really sluggish. By default VP9 is used, so I installed h264ify, but in that case (AVC1), YouTube limits video to 1440p, and 2160p is not accessible. I switched to Chrome, and VP9 decoding was again incredibly slow. Jet Racing Extreme Demo is playable – if we ignore the awful controls -, but it’s really slow to load. Once the reason could be that it requires a lot of RAM, and 4GB is not enough. Running htop while running the game showed that the RAM was fully utilized, and part of the swap was needed too (1GB+). Kodi 17.3 (installed with apt) was also a disappointment with H.264, H.265 and VP9 all relying on software decoding despite VAAPI hardware video decoding being enabled in the settings. That means the systems is usable with 1080p videos, but not 4K videos. Automatic frame rate switching did not work either. Audio pass-through with PulseAudio worked fine as I could play videos with Dolby Digital 5.1 (AC3) and DTS 5.1. Nice review, what was the idle power consumption with DPMS in off state? Thanks! Kodi runs very well with full hardware acceleration of H264 and H265 under LibreElec on my N3350 Up Squared board. Were you running the latest Intel drivers and a recent Kodi build with Apollo Lake support during your test? So everything is pretty recent. I’m been using Kodi with Apollo Lake on Ubuntu 16.04 before, and 4K H.265/H.264 video were playing normally. Maybe something has changed in Ubuntu 17.10.
sudo xset dpms force off No protocol specified xset: unable to open display ":0.0"
xset: unable to open display ":0.0"
I typed the command above while connected to HDMI, not in SSH terminal.